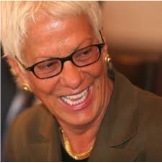 Ms. Del Ponte is a Swiss Prosecutor and diplomat. Within the United Nations System, she is a former Chief Prosecutor of two United Nations international criminal tribunals. As an investigating magistrate and public prosecutor in Switzerland, Ms. Del Ponte investigated and prosecuted cases of money laundering, terrorism, arms smuggling and espionage, plus other facets of organized transnational crime. After serving as the Attorney-General of Switzerland, in August 1999 she was appointed Prosecutor for the International Criminal Tribunal for the former Yugoslavia (ICTY) and the International Criminal Tribunal for Rwanda (ICTR). She remained Prosecutor at the ICTR and ICTY until 2003 and 2008, respectively. Ms. Del Ponte served as Swiss ambassador to Argentina from 2008 to February 2011, and since September 2012, she has served as a Commissioner of the Independent International Commission of Inquiry for Syria.